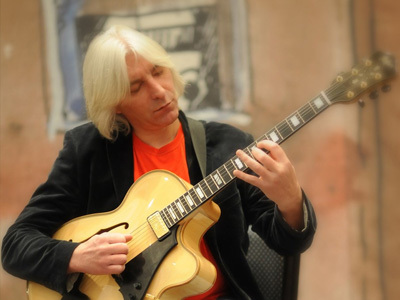 Had his stage debut in Poland, in the second half of the seventies, then took quite long to find "his own" kind of music, gaining experience on the way while collaborating with Wieslaw Pieregorolka Big Band, Alex Band led by Aleksander Maliszewski, Zbigniew Gorny Orchestra, and also Koman Band and Pronko Band. Performed in jazz clubs in Scandinavia, Germany and in the United States; appeared on a variety of festival stages such as: Jazz Jamboree, Zlota Tarka, Jazz Jantar and Jazz on the Odra River, Jazz Festival of "Piwnica pod Baranami" and Festival de Jazz de San Sebastián; took part in Polish Song Festivals held in Opole and Song Festivals in Sopot. Accompanied world stars, like Jose Feliciano, Shirley Bassey, Alan White (YES, Joe Cocker, Eric Clapton), Cindy Blackman (Joe Henderson, Lenny Kravitz, Cassandra Wilson), Tonny Royster Jr. (Branford Marsalis, Terry Lewis) Carmine Appice (Jeff Back, Ozzy Ozbourne, Pink Floyd), Siggy Davis as well as worked with numerous stars of the Polish music stage, like Hanna Banaszak, Ewa Bem, Urszula Dudziak, Grazyna Lobaszewska, Krystyna Pronko, Maryla Rodowicz, Lora Szafran, Marek Balata, Ryszard Rynkowski, Zbyszek Wodecki, vocal group Vox. Marek Balata, Ryszard Rynkowski, Zbyszek Wodecki, vocal group Vox. Highly values his professional contacts and cooperation with Heavy Metal Sextet, Walk Away, Zbigniew Lewandowski Quintet, Bober’s Friends, Charlie Green, Opole’s radio orchestra led by Edward Spyrka, international groups Human Elements and Yurala, or individual musicians, like Bill Mollenhof, The Drifters, Ralf Rickert, Carl Palmer (ELP). Cooperated and performed with the stars of the Polish jazz stage, such as Jarosław Śmietana, Zbigniew Namysłowski, Tomasz Szukalski, Jan Ptaszyn-Wróblewski, Krzesimir Dębski, Krzysztof Ścierański, Bernard Maseli, Piotr Baron, Leszek Możdżer, Adam Skrzypek, Janusz Skowron, Henryk Miśkiewicz, Krzysztof Przybyłowicz, Zbigniew Wrombel, Piotr Wojtasik, Anrzej Rusek, Maciek Sikała, Tadeusz Leśniak, Jerzy Główczewski, Janusz Stefański, Jacek Pelc, many of whom made guest appearances on his own three individual records. Took part in recordings of material for a number of musicians in studio sessions in Poland and abroad. He is dedicated to working with the young, being a lecturer in Mała Akademia Jazzu (Little Jazz Academy) in Gorzów, actively participating in projects and events, like workshops of BLUES NAD BOBREM (Blues on the Bóbr River) organized in Bolesławiec, or in international jazz workshops, like JAZZ HANZA in Koszalin. He co-musical projects with the Association on behalf of children and young people Ósmy Kolor Tęczy (Eighth Colour of the Rainbow). This kind of activity offers valuable experience and brings him a lot of satisfaction. 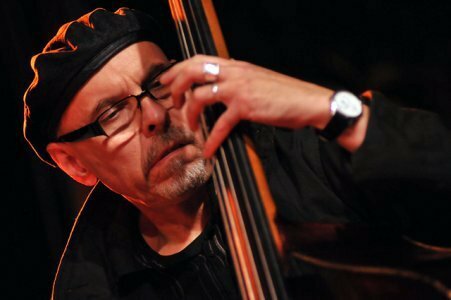 He is an extraordinary Polish bass player. Since 1965 to 1984 studied double bass, violin and piano. 1989- scholarship of Alban Berg Foundation in Vienna. He worked in studio with Hans Joachim Roedelius ( the pioneer of Contemporary Electronic Music and recorded few CD's (incl. ,,Theatre Works '' - with Brian Eno ). He performed and recorded with great EARTHA KITT and with Herb Geller, Oliver Johnson, Kosta Lucacs, Charles Owens, Billy Bang, Jocelyn B.Smith, Souleymane Toure, Daryl Waters, Abdu Salim, Patrick Farrant, Nirankar Khalsa, Jean -Paul Bourelly, Omar Sosa, DJ Spooky, Mariana Baraj, Eddie Henderson, Frank Lacy, Reggie Moore, Ashraf Sharif Khan ( sitar ), Sadiq Bey, Johnny Rabb. He contributed in theatre and multimedia projects with music by Yola Wesolowska. Stan also recorded few CD's with Eartha Kitt „ Live at the Theater des Westens '' with Fuasi & Ensemble „ Fuasimodo rings a bell'', „ Cafe Central'', with Sharifa & Wordsong „ Sharifa's favorite things ''( WEA//Warner ) with Siggy Davis and J.P Bourelly „Just as I am '' and Christof Vonderau ( CD ,,Cave Painting "). CD 2009: OTA Records "TALES FROM THE EARTH" feat. Omar Sosa / Mark Weinsten / Aly Keita / Jean - Paul Bourelly / Stan Michalak / Marque Gilmore / Aho Luc Nicaise / Mathias Agbokou. Composed music for pantomime performances by Tomasz Dajewski. Contributed in several projects with hip-hop artist Spinache and with multimedia artist Jörmungarden. Performance with his own project In The Open. He was born in Brooklyn and raised in Jamaica, Queens in New York. 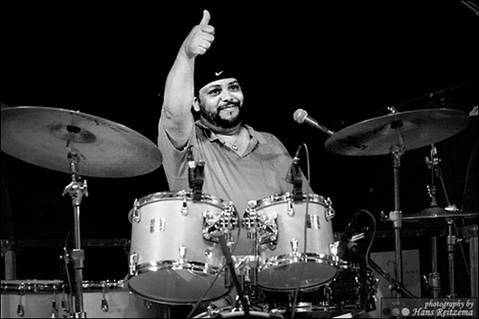 A graduate of Springfield Gardens High School, Berklee College of Music in Boston and Five Towns College (New York), master classes led by Elvin Jones, Artie Simmons, Billy Cobham, Tony Williams, Jack deJonette, Lenny White, Narada Michael Walden. In the years 1981-1993 global touring and recording seven CD's with the legendary, cult group DEFUNKT ("Thermonuclear Sweat", "Heroes, " "Live at the Knitting Factory, " "The Legend of Defunkt"). Concerts and studio recordings include from The Golden Gospel Singers, Jaco Pastorius, Teddy Wilson, Kenny Kirkland, Melvin Gibbs, Mike Stern, Nippy Noya, Bob Singleton, Latoya Jackson, Candy Dulfer, Barbara Dannerleine, Alison Moyet, Scott Hamilton, Monty Alexander, Xiam, Jasper van 't-Pili Pili Hof, Wolfgang Schmidt, Gary Valente, Ed Schuller, Joseph Bowie, Lester Bowie, Jean Paul Bourelly, Omar Sosa, Jocelyn B. Smith, Uli Lenz, No Angels, with the Siggy Davis - "Just as I am '', with Xiam-"The Shadow Of My Soul", with Sharif & Wordsong-"Sharifa's Favorite Things" (WEA / Warner). Composition and performance of music for the show R.A.F. Berlin's famous Berliner Ensemble theater.